My friend, John Britt sent me something I want to share with you, that is different from my usual political posts. I hope you will find this beneficial. Recently, a friend gave us a copy of a book titled, "Journeys with the Messiah." 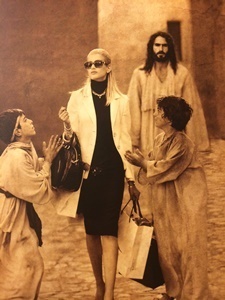 Michael Belk, a successful fashion photographer, felt God's call to write and photograph this book, paraphrased around the parables of Jesus. He went to Italy and found a town that he felt looked like the Judean area in which Jesus lived. He then sought out a model that resembled his idea of what Jesus might have looked like. Next, he assembled a cast of biblical and modern day characters who might represent those New Testament parable participants. So, the visuals show a "robed Jesus" in an ancient city surrounded by modern day people plus those who might represent the people of Jesus' day. I have attached a photo and one of the parable stories so you can grasp the stark contrast. Here is the narrative with scripture reference from Matthew 6:19-21 that ends with "where your treasure is, there will your heart be also." The World Health Organization reports that two-thirds of the world's population is underfed or starving. Every day, 16,000 children die from hunger-related causes. That is one child every five seconds or about nine children in the time it will take you to read this message. Hearing statistics like this, I immediately think of far-away places like India and Africa. And then, I learn that in the United States, one out of every eight children go to bed hungry every night. There is a story about a man who stands on a hill overlooking a refugee camp. Seeing the starvation and death, he turns his face skyward and screams, "God, how could you let this happen?" God responds with, "How could you?" We have the means to fix this. The world's poorest could have their health and nutritional needs met for less than 25% of what Americans spend on clothing each year. The issue is not a lack of abundance. It is simply a lack of distribution. How many children will die today while I sit on my savings account? It is a painful question to ponder.